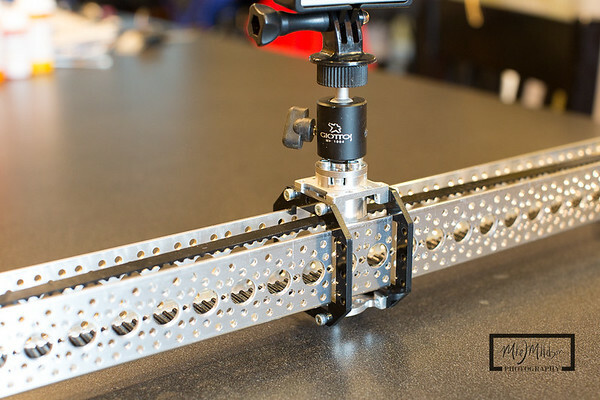 One of the problems with the base channel slider kit from ServoCity is the mounting options. 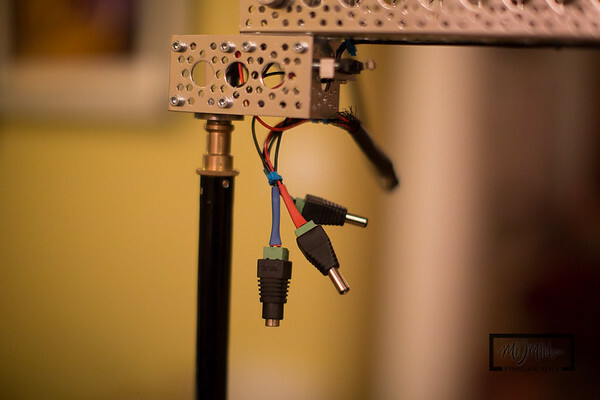 I wanted to be able to use a standard tripod with the slider and have a way to mount the potentiometer, switch, and battery without getting in the way of the slider. I decided to add another channel offset to the main slider, and use a 1/4" screw plate. 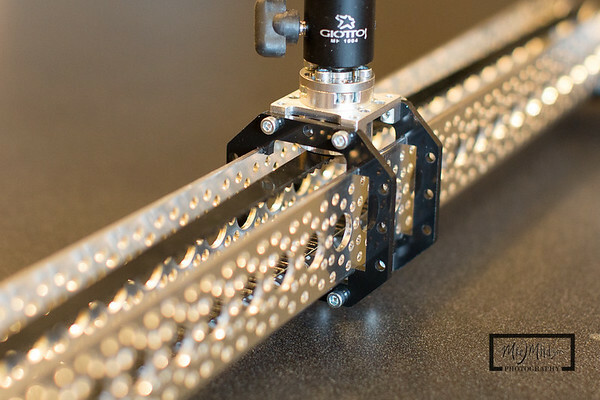 Centering the mount in the middle of the channel allows the entire slider to be positioned horizontally or vertically. 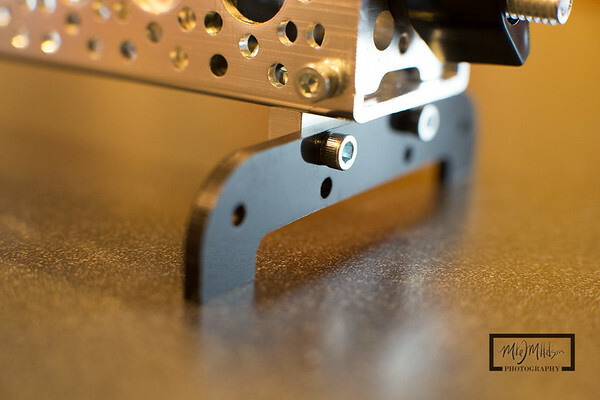 ServoCity also has 3/8" screw plates to attach directly to the tripod base without ball head. I was able to mount the control knob for the potentiometer, Foward/Reverse switch, and circuit board to the lower channel. The battery is attached via velcro. 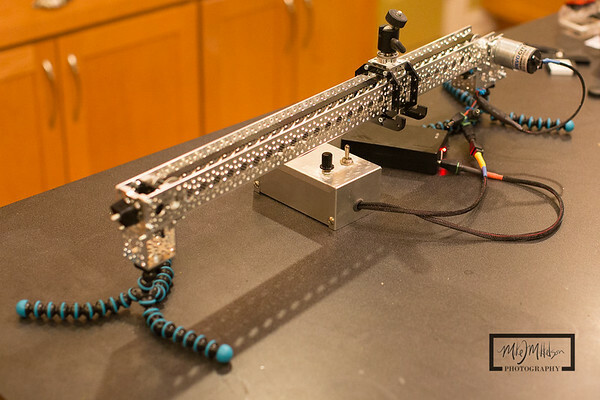 The video below shows the slider in action. 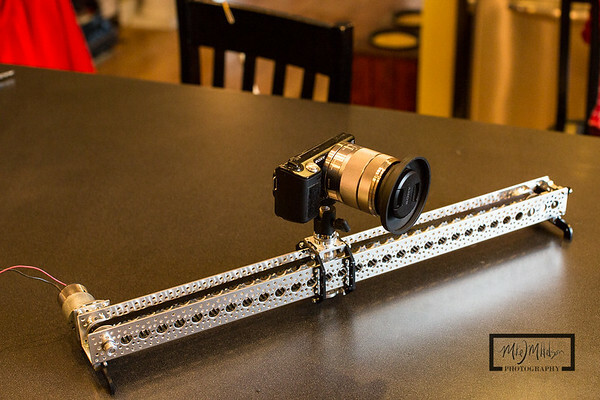 I've used different camera arrangements showing that the slider can be used in a dual camera arrangement as well as pull a dSLR vertically. I will probably use this with my Sony NEX-5 in combination with a GoPro most of the time. I don't plan on using it for video due to the 1/2 RPM motor, but that could always be swapped out for a faster motor. I've seen a couple of DIY rotor mounts on the GoPro user forum, and a commercial version like the Rhino Swivel, but I wanted to try and build my own. This is a method for getting unique footage from a GoPro camera. I've built other unique rigs from the GoPro, like a Scorpion Mount, but this one intrigued me enough to go for it. 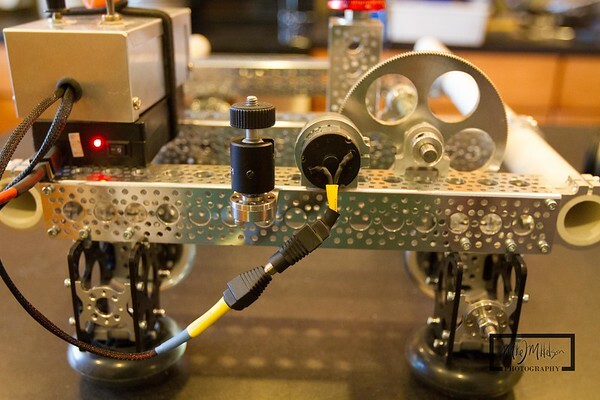 ServoCity.com has new Actobotics parts that looked like it would work great for this project. 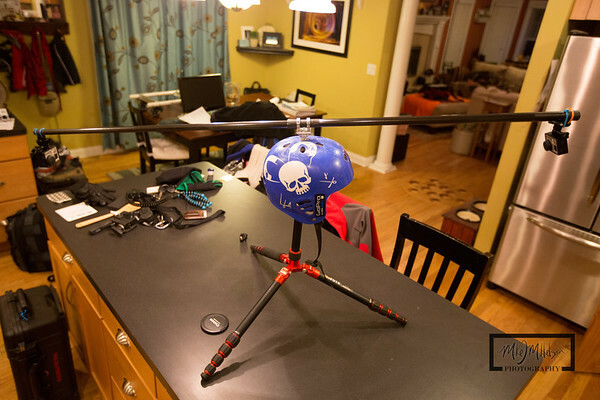 Most of the rotor mounts that I've seen are for a single GoPro camera using counterweights on the opposite side. Since I have 2 GoPro HD Hero 3 cameras, balancing one on each end of a pole makes balancing easy. 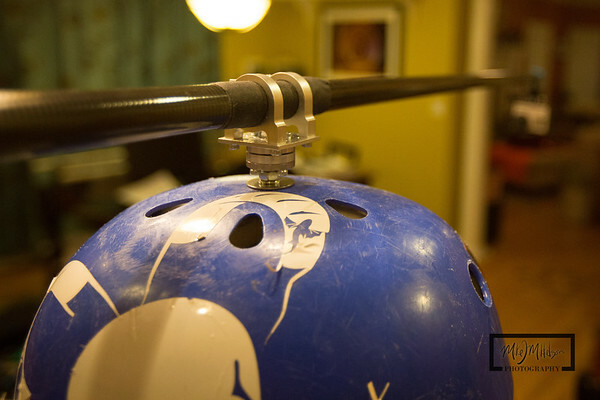 I used an old ProTec helmet, a section of a carbon fiber pole normally used in my Pole Aerial Photography rig, and the Actobotics parts. 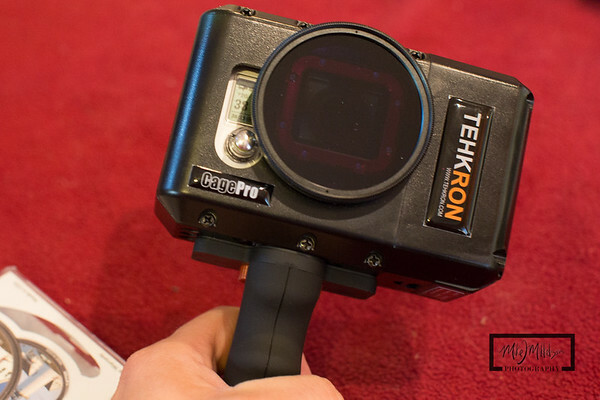 Using 2 GoPro HD Hero 3 Cameras will allow for recording using different setting at the same time, or having one do video and the other images. The red tripod is only being used to hold the helmet up, and is for display purposes only. I drilled 2 holes in the FCS surf mount which will be used with Zip Ties. I don't have any plan on using this mount for an actual surf board, so no harm adding the holes. I used a bit a gaffers tape at the end of the pole and attached the FCS mount using zip ties. 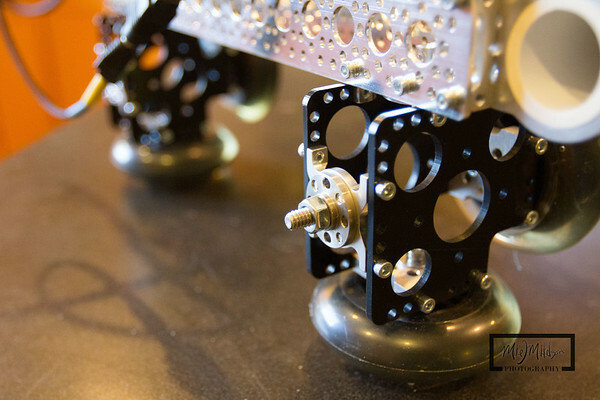 Here is the Actobotics mount fully assembled with the 1/4" round screw plate attached directly to the swivel hub, which is attached to the flat channel bracket, and finally the PVC clamps. 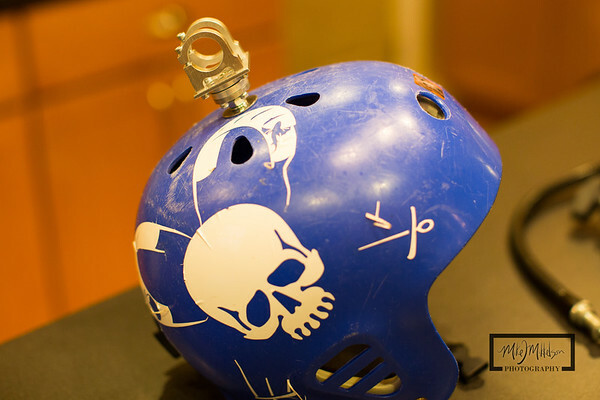 This mounts to a 1/4" hex screw on the top of the helmet. 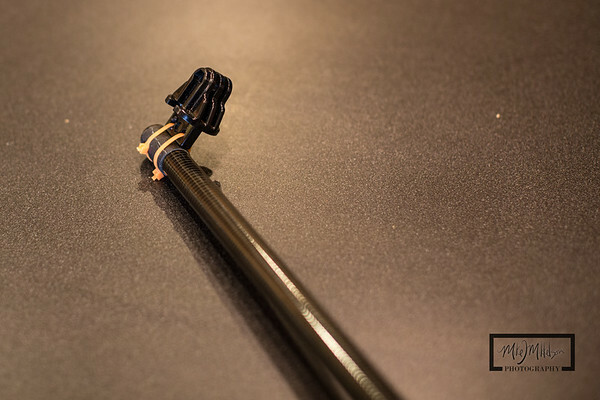 Here is an alternative method for attaching the GoPro to the end of the pole using a section from the Front Helmet Mount. The Actobotics mount on top of the old protec helmet. 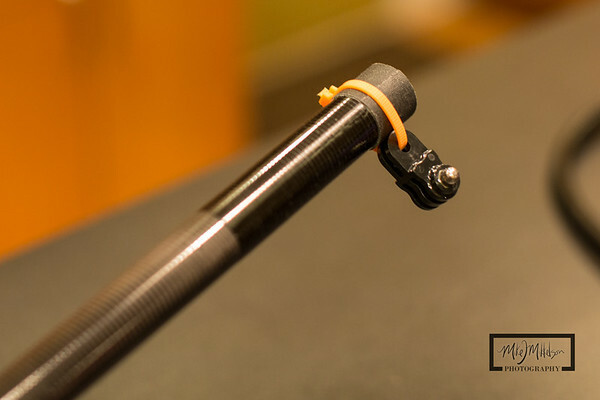 I added an additional link to the fat end of the pole for the alternative mount for stability. The pole is 59" long with the balance point being not exactly half way. 25" from the center of the helmet mount to the camera on one side, and 29" on the other. I did some test footage in my kitchen. I hope to use this rig on a bike, or maybe in the water on a Flyboard! It's probably one of the most crazy rigs I've created, and will probably get some looks from others. Until I recover from my latest back surgery, I'll just have to have others ride with it. 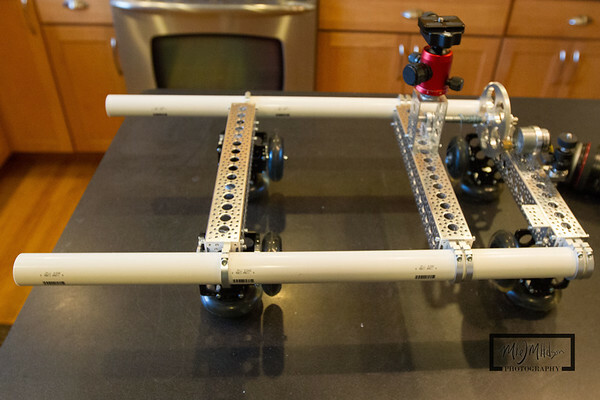 Building my recent projects, I did set up the GoPro to capture video and time lapse of the Actobotics Channel Slider Kit and my adjustable width motorized time lapse dolly. I spent some time this morning putting together a time lapse sequence of these builds. 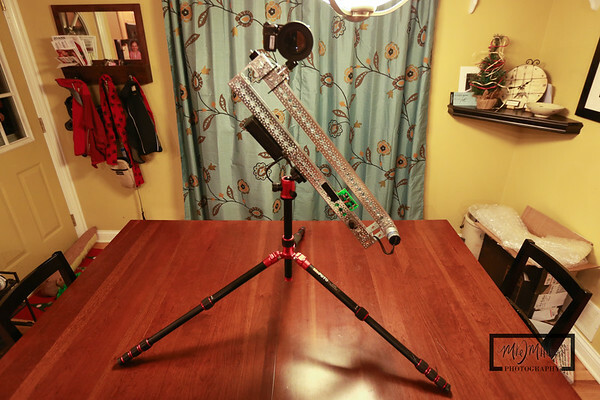 Back in 2011, I built a DIY motorized time lapse dolly that would work on a standard extension ladder. I used some standard skate wheels, some plywood, and a few parts from ServoCity.com. The biggest problem was portability, and I wanted to be able to use different ladders. I have 2 extension ladders, but they are not standard width. I also have access to a third extension ladder at my 2nd job that is also a different width. I had ideas in the past on how to resolve this, but not until I saw the new Actobotic parts from ServoCity that I figured out a better solution. Here are the links to my original build. You'll see that I have recycled some of the components. 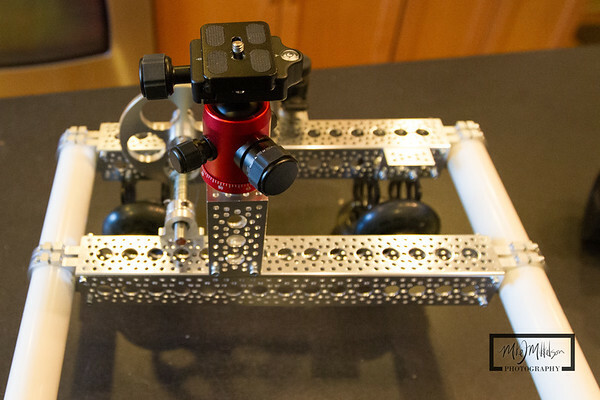 Here is the completed dolly with attachments for multiple cameras. I will normally only use 2 cameras on the rig, but thought that I would show how versatile the Actobotics channels are, as you can use multiple camera mounts. 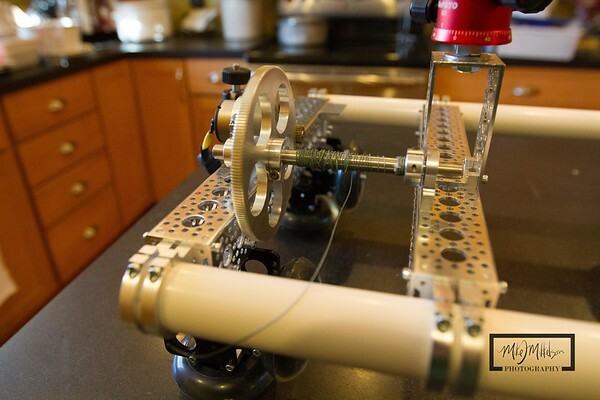 The Actobotics 1" Tube Clamps, I was able to use PVC pipe in the structure of the dolly. Loosening a couple of screws allows me to adjust the width of the dolly to fit onto different extension ladders. You could technically use other rails, such as 2x4's. Once I figure out the maximum width of my biggest ladder, I'll cut off the extra PVC, but you can at least see that with the current configuration, I could go a couple of feet wide. I'm still using a system where the motor pulls itself up the ladder using heavy duty fishing line. 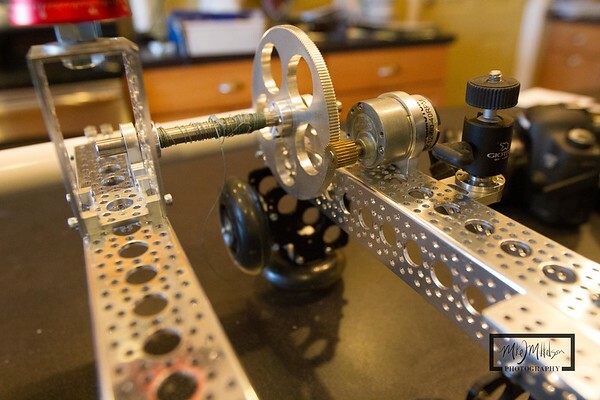 On the old dolly, I used a gear motor box, and was able to eliminate that gear box and use different components to mount directly to the channels. 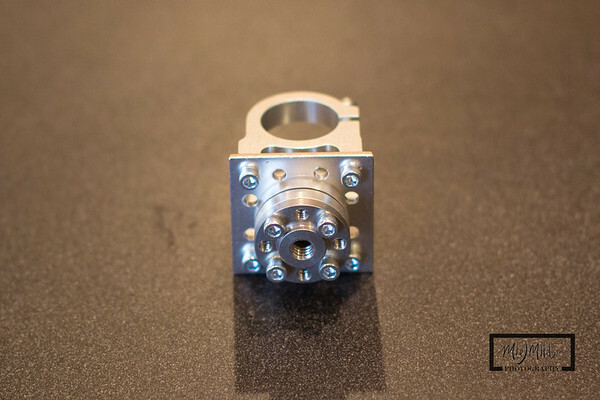 Using a 3/8" hex screw on a channel extension, I mounted a ball head for any of my larger dSLR cameras. 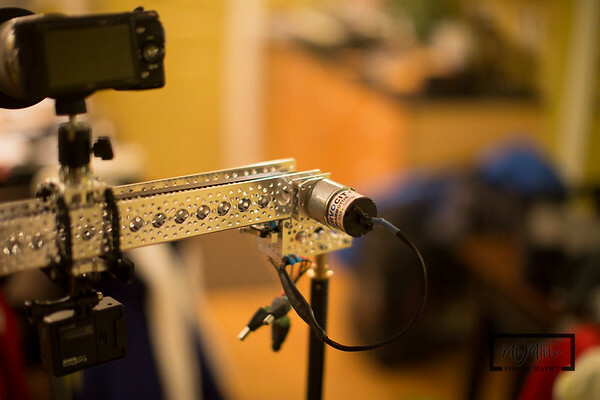 Since I'll be re-using the battery and Potentiometer from the old dolly, and re-purposing it it with my new channel slider, I rewired it to that using quick connects it can be used with both sliders. I did replace my original 12V battery with a smaller rechargeable model from Amazon, as it wasn't as heavy and had a built in on/of switch. I also created new wiring using these connectors to clean up the wiring. I need to get some velcro to attach the battery and switch box, but in the meantime, I just used a bungie to secure it. Here is the quick connect to the motor. 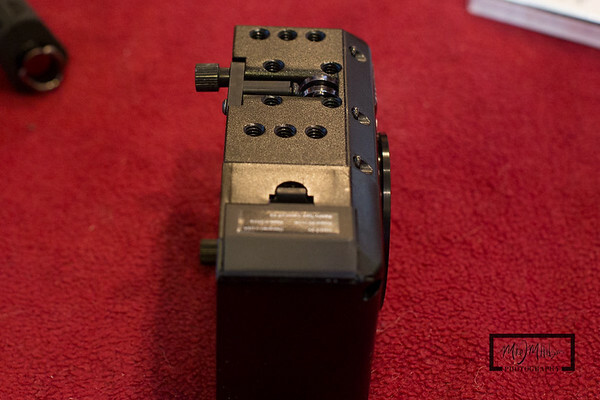 I stole the limit switches off the old dolly to put on the mini channel slider, so I'll need to replace those. You can see a mini ball head for an additional camera mount. 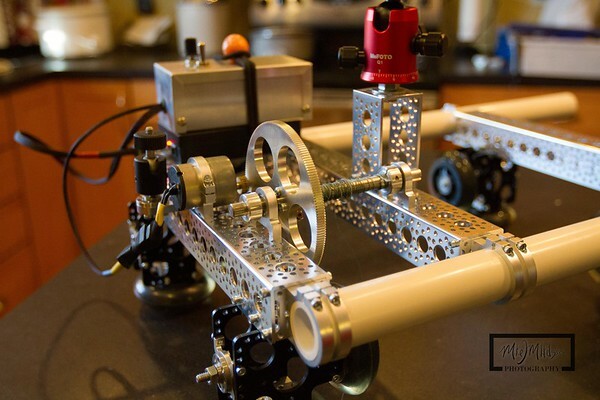 Adding a larger gear will really slow the movement of the dolly down. Another 1/4" threaded mount point using a screw plate. 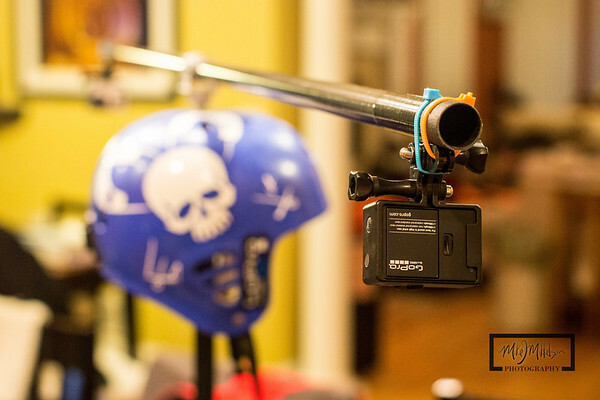 Perfect for mounting a GoPro camera for video or time lapse. I reused the skate wheels, bearings, and gear sprocket from my old dolly. In part II, I'll test the dolly out on a the ladder to see how long it takes to traverse the distance. Update: 11/26/13 - I sent a somewhat stern e-mail to Tehkron's support complaining that I would have to pay for shipping to get the product replaced. They have since modified their response and sent me a shipping label to send the defective product back, and sent a new one as a replacement. I hope that the new one does not have a defective battery door. The support representative responded to my e-mail in less than a day apologizing for the previous correspondence. I will update this post when I receive the replacement and alter my review as appropriate. Update: 1/17/13 - After waiting almost a month and no replacement, I finally sent the broken CagePro back. Apparently, even though the letter from Tehkron stated that they would send me a replacement right away, they were waiting to get the original back from me. I would recommend that Tehkron alter their RMA process to send out replacements ASAP as stated in their communication, and use the customer's Credit Card as collateral, like pretty much every other technology company on the planet. I finally got the replacement CagePro, and they did include a spare battery door, which is what they claimed they couldn't send me to begin with. Very disappointed on how this all went down, but I did get a replacement, and will be very gentle with the plastic door. 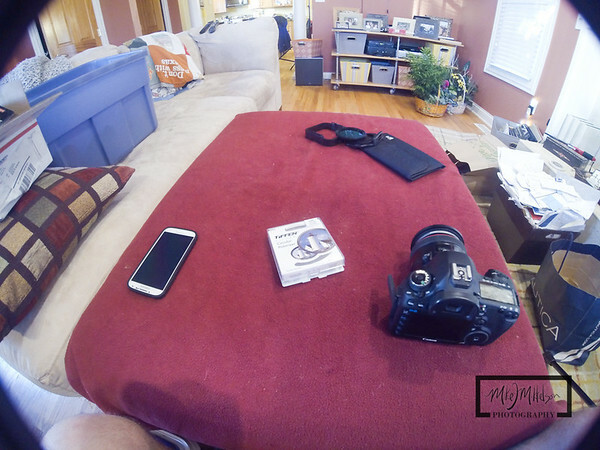 I enjoy taking time lapse sequences with a number of my cameras, and the GoPro HD Hero is usually at the top of my list because of its ease of use. The problem is that the battery does not last long enough without an external source. 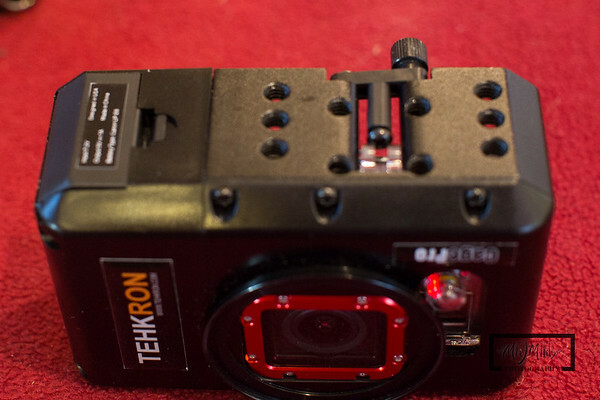 When I saw the Tehkron CagoPro, I thought it would be a good fit since I already have cameras that use the LP-E6 Batteries from Canon. I am modifying my slow motion time lapse dolly, and needed to have something that would last for more than just a couple of hours. Here are my initial impressions. FYI: Red Lens Ring - I change the lens ring on my housings so that they are easier to identify as mine, and also find if disconnected to whatever I'm riding. 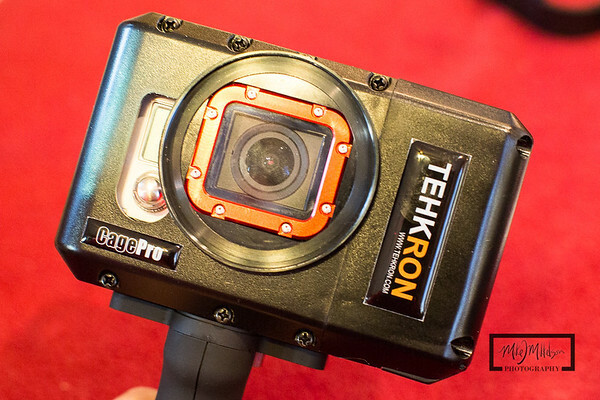 This is not included with the CagePro, and definitely not standard with GoPro. 62mm threaded filter ring. 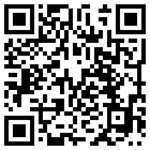 This will allow for a wide number of filters to be used for additional image control. I also purchased this adapter ring to test with graduated filters. I already have multiple Canon dSLR cameras that use the LP-E6 Battery, so it worked out great for me not having to purchase this separately. Lots of 1/4" threaded mount points. Worked well with my pistol grip mount that I also use with a light blaster. Ability to use the LCD or Battery BacPac, making it much more versatile. 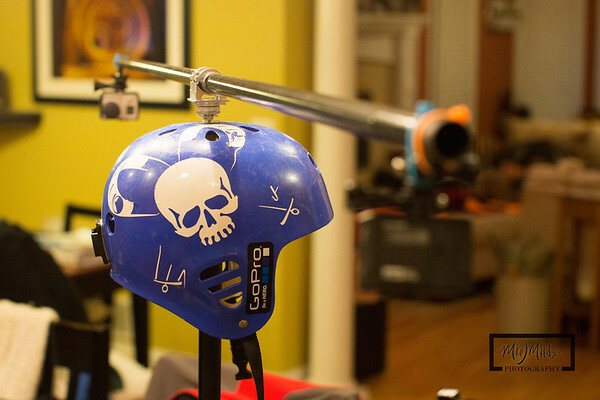 Requires the GoPro skeleton housing. This was listed on the bottom of their website, but it wasn't something that stands out. You can pick on of these up on Amazon for $27.23 on Prime. 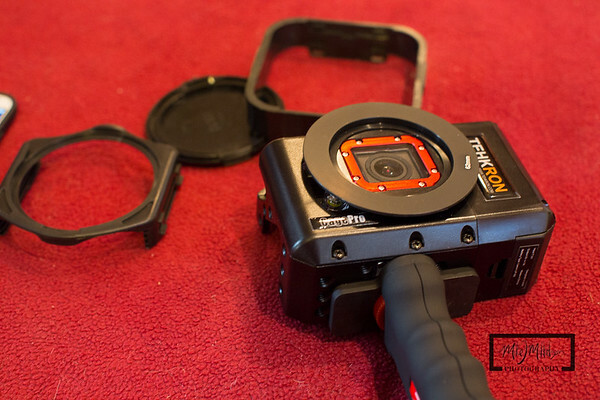 You could drill a hole in one of your existing housings for the cable to go through, but the skeleton housing is pretty cheap, in comparison to other GoPro products. 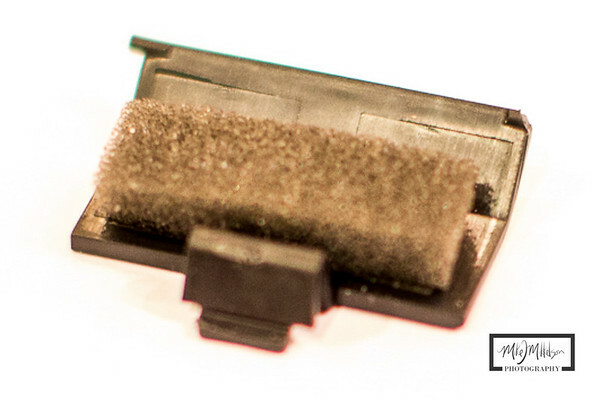 The door and latch for the LP-E6 Battery is plastic. The little tabs that allow the door to hinge broke off within the 3rd time putting the battery in. I have contacted Tehkron for a replacement, but this is very poorly designed. Most of the rest of the body is machined aluminum and this seems like cheap plastic. Just be careful when taking a battery in and out. They wanted me to to pay for shipping so that they could evaluate whether or not to send a replacement, even after I sent them the pictures. After a email complaining, they have since sent me a replacement free of charge with a shipping label for the old one. Very expensive for the initial prototype. You can use any standard external USB battery to accomplish the same thing. 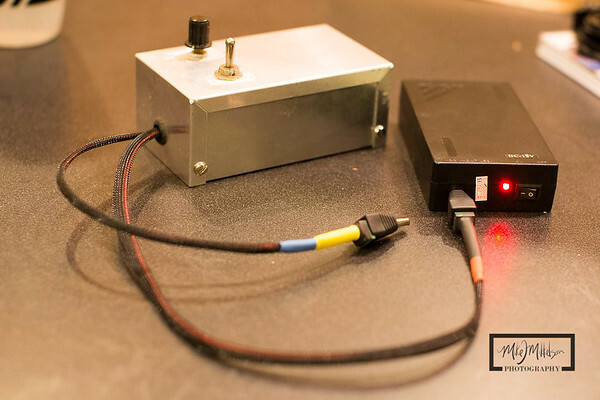 The benefit of the CagePro is that it's all in one enclosure, but I will not use it enough to justify the $130 price. Big. Since the skeleton housing is required for this model, I think that it should have been designed to use the camera only without the housing, thus reducing the size and weight substantially. Create one that us the ability to use filters, but not have to use the skeleton housing. 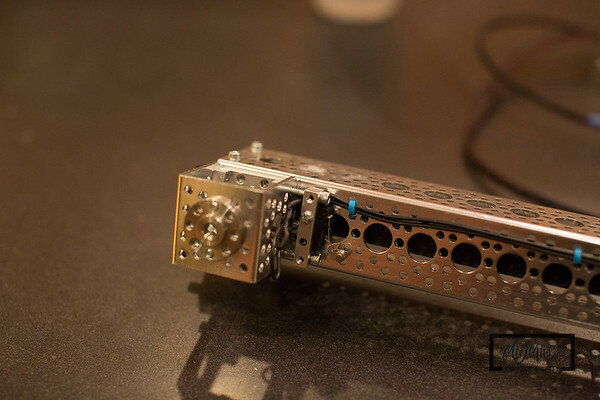 The electronic circuit board is exposed inside the case. The short USB power tether cable needs to fit inside a small area near the exposed circuit board. I'd like to see this covered or sealed. Cannot use external microphone, since the the USB slot is being used by the CagePro for power, and the only way to use an external mic is with the 3.5mm mic adapter. 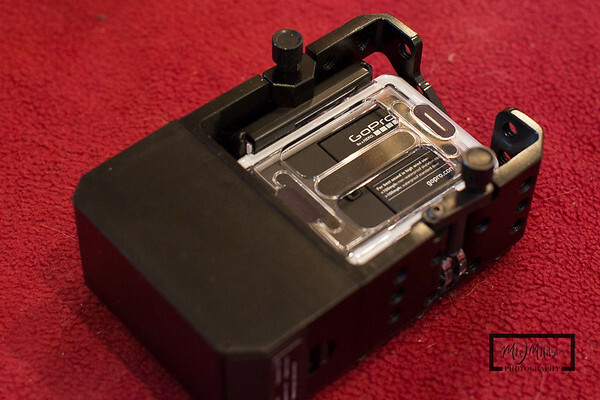 Create a mini-USB port on the outside of the CagePro to charge the Canon Battery. This might allow piggybacking another external portable battery pack for even more extended time. Swap the battery to be on the opposite side, allowing for access to the HDMI port. With the current design, there is no way to have access to that port though the skeleton housing. Door broke almost immediately. I contacted Tehkron via e-mail and they responded the same day. Hopefully, I can get a replacement, or a couple since this seems to be a problem. Since they will not send me a replacement door, I'll just have to tape it on when I use this. Multiple 1/4" threaded mount points on the bottom and side. Room for the LCD and Battery BacPac. 62mm threaded filter mount allows for a ton of different options for ND or Polarizing filters. You will have to crop images or videos since there is some vignetting from the filter. I also tried a stepper ring to be able to use Graduated filters and an adapter with the GoPro. 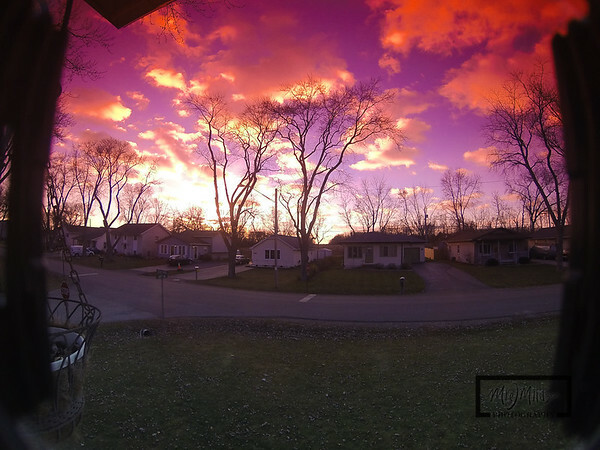 Obviously, the GoPro is a wide angle lens and will have to be cropped when using the graduated filters and adapters. I did some tests to see how long the camera would last using a fully charged GoPro, Original GoPro Battery BacPac, and LP-E6 battery. Please note that all of these tests were done using the intevelometer set to grab an image every 5 seconds. The second test was with the Original LCD BacPac, Canon LP-E6 Battery, versus the battery BacPac. Latest Test was with a brand new off-brand LP-E6, HD Hero 3, and NO BacPacs. I look forward to being able to do extended time lapse sequences with the GoPro. However, I doubt that this cage will be used by me for anything else, as it adds too much weight and bulk to be used for action sports. I did get over 7 hours of time lapse photography at 5 second intervals, so it does exactly what I need it for. I think that I could have just done it with an external USB battery for much cheaper. After my poor interaction from Tehkron support, I doubt that I personally would ever buy anything else from them. 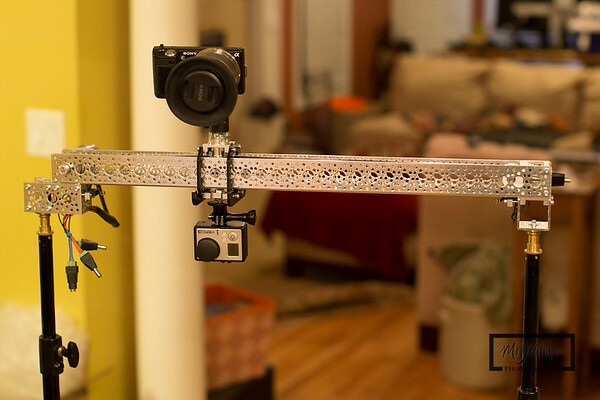 Even though I have a slow motion ladder dolly for moving time lapse projects, I've been thinking for a while that I would invest in a smaller slider for use with my smaller cameras, like the GoPro or Sony NEX-5. I have been working on modifying my larger dolly to be flexible so that I could use it on different width ladders, but still wanted something portable. 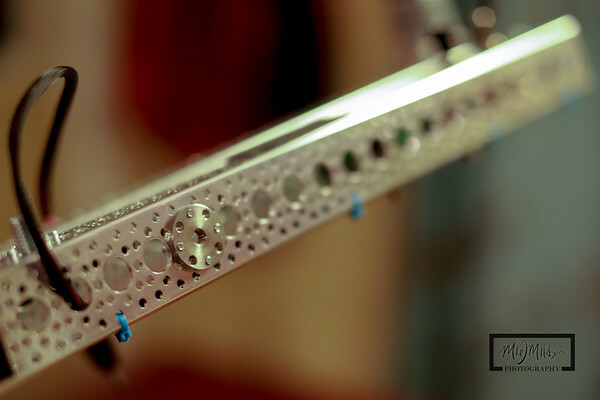 ServoCity.com has some new channels and parts from Actobotics, which gave me the idea to redo the larger dolly. 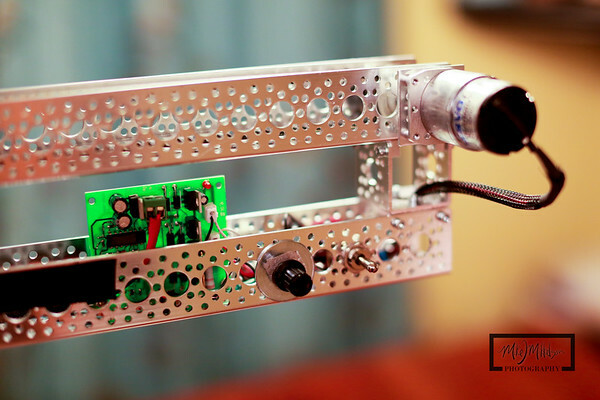 As an impulse, I also ordered the Channel Slider Kit, for more of a portable solution. 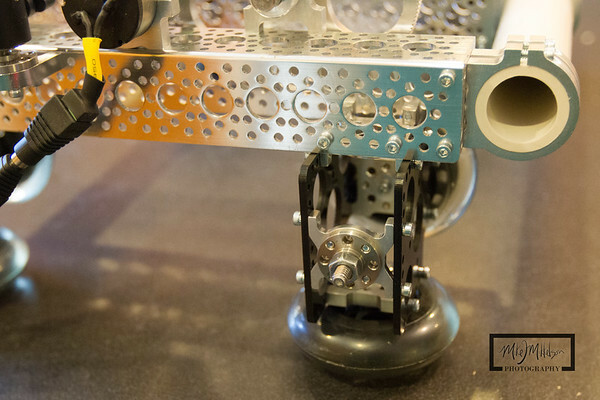 You can think of the Actobotics parts like an Erector Set on steroids. It took about an hour to assemble the original kit. 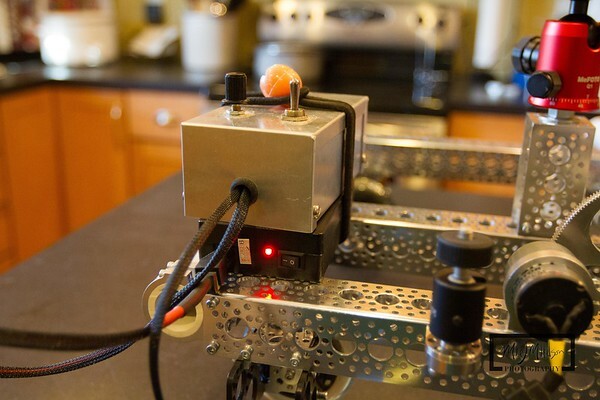 ServoCity.com has excellent video tutorials on how to put the slider together. I also upgraded to the full size Channel Slider A (585550), versus the ones that came with the kit. I wanted to be able to use heavier cameras than just a GoPro, and also potentially use 2 cameras at the same time. I felt that these have more stability than the original channel sliders. I added a 1/4-20 Screw Plate to the top so that I could easily add a mini-ball head or other 1/4" accessory to the top. 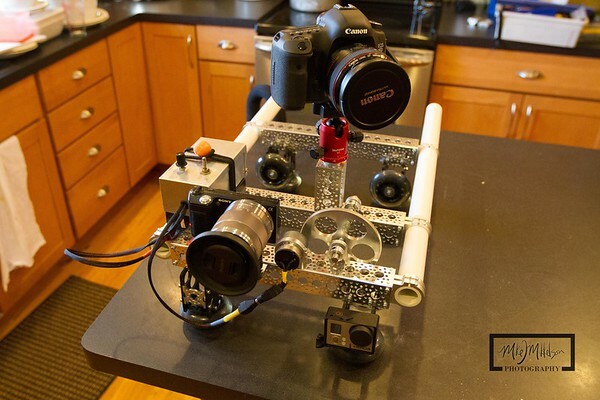 Here's a picture of the basic slider kit with the upgraded channels holding a Sony NEX-5. 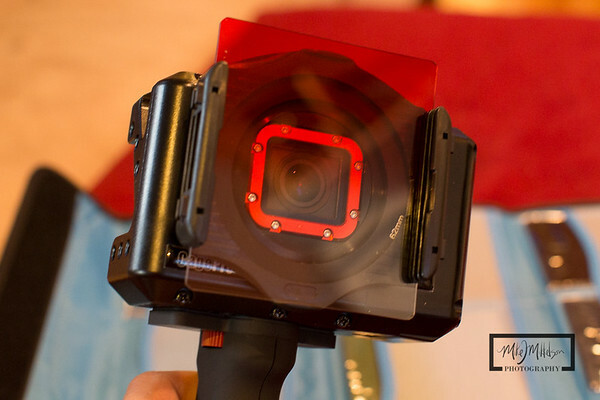 This camera is right on the edge of being too heavy while using the original feet to stabilize the slider. I decided to make some upgrades on how to mount the slider. Since I'll be using the same battery and Potentiometer from my full size slow motion dolly, I needed to make some changes and add some quick release connectors. I tried to clean up the cabling from the original build, and now I just plug in and it's ready to go. 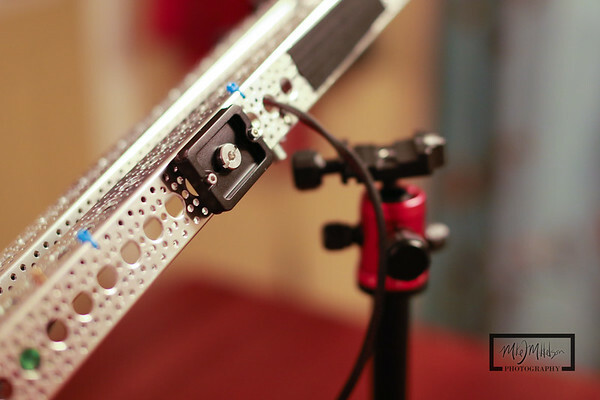 In my original slow motion ladder dolly, I had added limit switches so that the dolly would stop when it got to the end of the track. I thought it was a good idea, as there is potential of burning out the motor if you don't stop it when it gets to the end. I used the same concept and wired some simple limit switches on each end. This does reduce the track span by about an inch, but it will prevent issues. This way, I can walk away from the slider and not worry about if the motor will stop or not when it gets to the end. I also added an additional 1.50" channel to the bottom to mount the limit switch and add a 1/4" screw plate to the I can mount the slider to a set of light stands, tripods, or jobypods. 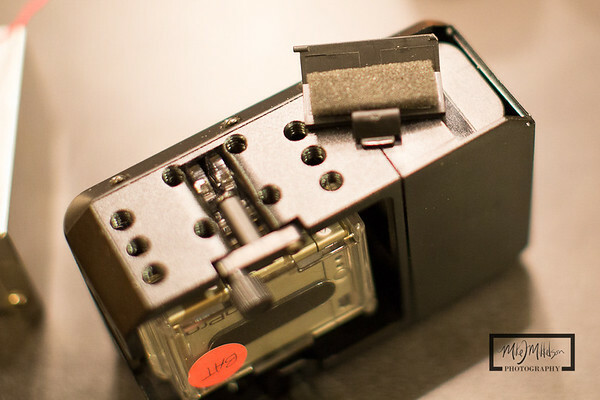 Here you can see the one side of the slider attached to a light stand mount, and also the limit switch underneath. 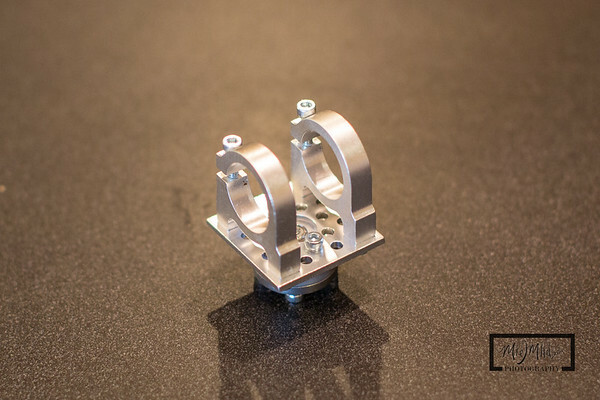 The 90 degree dual-side mount (585470) was re purposed, as they were originally used for the plastic feet. I used them to attach the limit switch which will stop the dolly when it gets to the end. 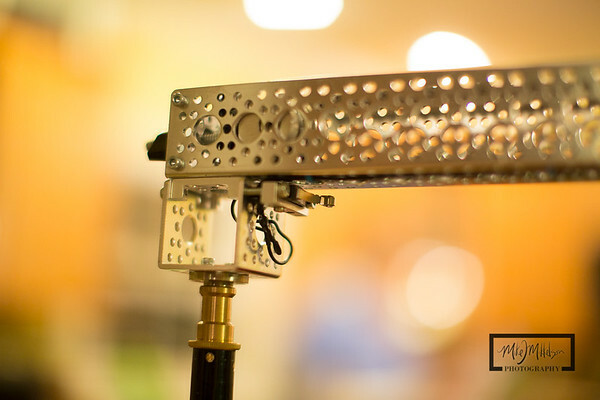 Attached to 2 light stands, and multiple cameras attached to the channel slider. 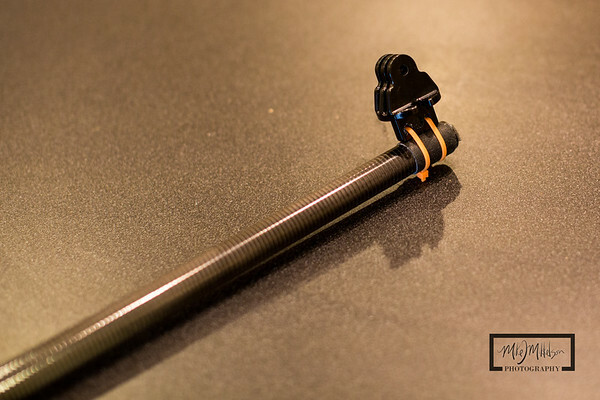 I used a Quad Hub Mount E (545452) on the bottom of the channel slider so that a second camera could be attached, for an even simpler method of attaching a 1/4" hex bolt, which worked nicely with the GoPro HD Hero tripod mount. I used a 1/4" round screw plate with a 1/4:" hex bolt to attach to the top of the slider with a mini- ball head. One challenge with the limit switches is that once the channel sliders turns off because it hits the switch, there is no way to reverse direction without power. I wired in a couple of extra power connectors, each with different polarity directly to the motor, so that I could back the channel slider off the limit switch when necessary. It also allows me to to run the slider without the Potentiometer and directly to 12V power if I need it. I'm currently running a 0.5 RPM gear motor, and have a couple of other faster models, but wanted this slider to go as slow as possible. With the Potentiometer, I was able to get it slow enough to traverse the channel in 32 minutes, so pretty slow for a 2 foot slider. You can see the old feet re-purposed as mounts on the bottom of the channel slider, which is what strikes the limit switches when it gets to the end of the track. 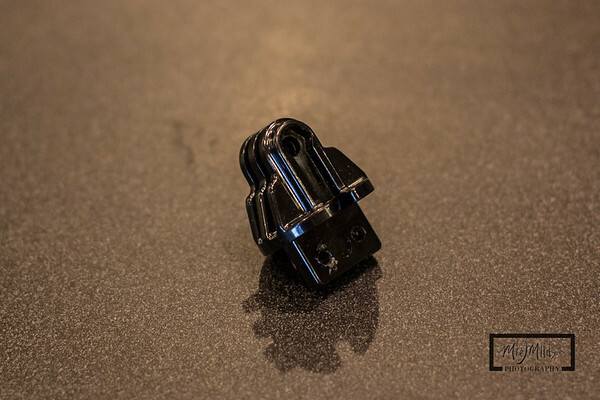 Since you can use pretty much any tripod, jobypod, lightstand, or anything with a 1/4" attachment bolt, you can get this thing pretty sturdy and stable. 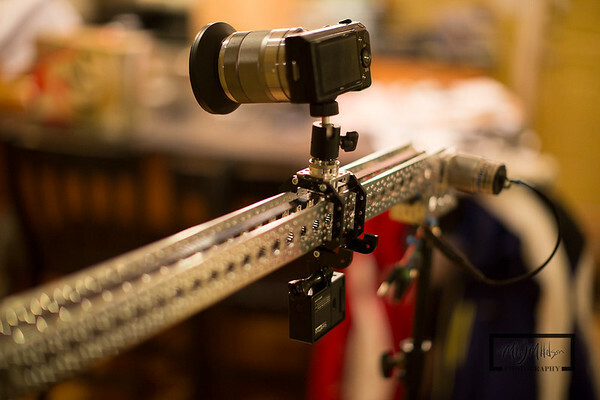 With a bigger ball head, I wouldn't hesitate to put my larger dSLR camera on this slider, asssuming that the mounting points on each end were used. Now that this is complete, I plan on ordering another 24" channel and mounting it on the bottom so that I could use a single 1/4" round screw plate to attach the entire slider via a single tripod.